Starving Artistamps is the sponsor this week over at CPS - and the Starving Artistsamps Design Team is playing along with this weeks sketch. Be sure to check out the Starving Artistamps Gallery for creations from the Design Team. On my card, I rotated the sketch to fit the image I wanted to use, and made my focal panel just a tad larger. My image is black embossed then colored with Shimmerz Paints. 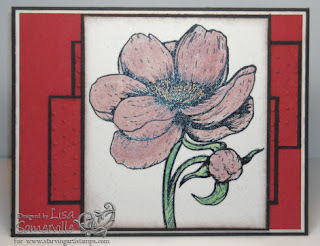 The panels behind my image were run through my CuttleBug Die, then I used the CuttleBug Highlights Technique and adhered them to my black card stock panels then to my base card as shown. Your card is so beautiful!! I love the colors and that big flower!! Very pretty, Lisa! I like the way you kept the BG monochromatic and varied the textures. I bet the shimmer is AWESOME IRL!! You can see that I rotated my CPS card too! LOVE your take on the CPS sketch and Love the Shimmerz on here. Beautiful job with the CPS Sketch, Lisa--I bet the shimmer is amazing in person!